Get started with a tour of a Washington externship location. Or call us for more information at (206) 504-1680. Seattle Film Connection Film School is your only real choice if you want to break into the film industry. Do you want to make money telling stories? Do you want to write, or direct, or just be a behind the scenes person? Seattle Film Connection Film School can help. The Film Connection operates on an apprentice/mentor basis. You are paired with a currently working pro filmmaker who will help you find work in the industry. You want to direct horror flicks? Great, we’ll pair you with a horror director. You want to write romantic comedies? No problem, we’ll pair you with a currently working romantic comedy writer. Whatever you want to be, we can help. And consider this: Film Schools are just getting even more expensive. And what do you get when you leave? A diploma? Some film theory knowledge? Is that really enough to justify the price tag? With the Film Connection you leave with real bona fide industry connections that will, if you work them right, lead to work. To APPLY for our Seattle Film School, click here. SEATTLE, Washington is fourteenth in the DMA listings. Also known as The Emerald City, Seattle is famous for its stunning scenic views. Surrounded by lakes, rivers, Puget Sound, and mountains, Seattle is a recreation enthusiast’s dream come true. The greater Seattle area is home to 2.8 million people. You have heard of Microsoft, Nordstrom’s and Starbucks, who are based here. Also known as the birthplace of grunge rock and espresso coffee, Seattle is the home of baseball’s Edgar Martinez, glass art’s Dale Chihuly, musicians Pearl Jam, Soundgarden, Queensryche, Ann and Nancy Wilson of Heart and Kenny G., software giant Bill Gates, maestro Gerard Schwartz, actor Tom Skerritt, writers Ann Rule, Tom Robbins and Robert Fulghum. Seattle is well known for its fresh seafood and inventive Northwest fare. Rainier Square in the heart of Seattle,offers world class entertainment, commerce, fashion, art and design, while University Village is the premier open-air lifestyle shopping center in the Pacific Northwest. In all of Seattle, West Seattle not only has great views of Elliot Bay and the skyline, but also plenty of hip restaurants. This area was an independent town until forcibly annexed by Seattle in 1907. Seattle has no shortage of local bars; from Belltown’s posh lounges to the University District’s college bars to Capitol Hill, Seattle has a something for everyone. As for sports and recreation, you can catch the Seattle Seahawks, the city’s pro football team, or hang with the Seattle Mariners Baseball Club when they play in Safeco Field. Or if you are into the outdoors, hiking, biking and water sports are huge. But if you want to rip the new Beginner’s Trail on a bike at Seattle’s Colonnade Park, you’ll need to get some practice. If you choose to live in Seattle, you will be called a Seattleite. For film enthusiasts, this city is always a favorite for locations. You probably have seen Sleepless In Seattle, The Last Mimzy, Firewall, The Ring 2 and An Officer and a Gentleman, all of which were filmed in this area. The Fugitive television series was shot here as well. 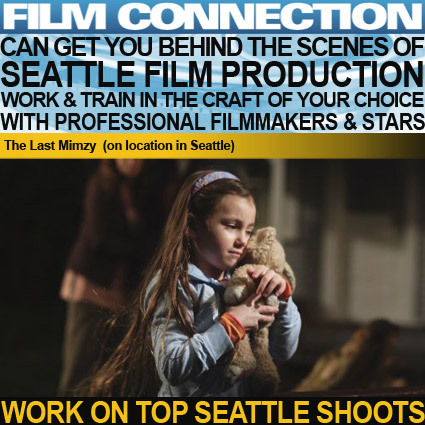 So if you want to work in the entertainment industry – film or television – in Seattle, the FILM CONNECTION can set you up to work in a real Seattle production company or TV station, with a real professional serving as your mentor, so you gain both the experience and industry connections you need to break into the biz. FILM CONNECTION’s Film School has been hooking up aspiring filmmakers with working professionals for over two decades. Check us out and see why over 70% of our Film School graduates find work in film and TV, right in their home town, like Seattle. To APPLY click here.